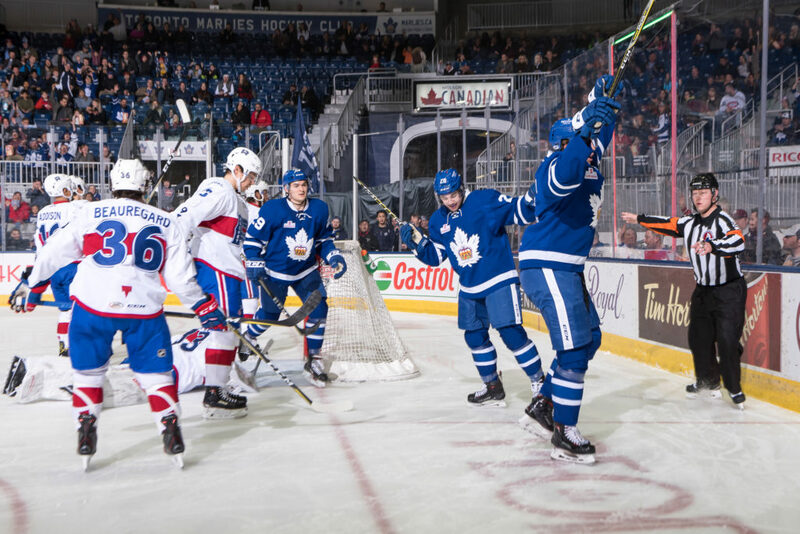 The Toronto Marlies and Laval Rocket faced off for the twelfth and final time on Saturday afternoon, fighting hard in a back-and-forth contest. 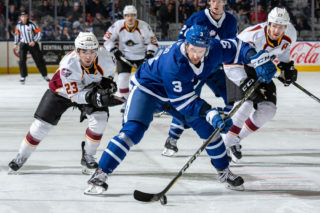 It was also a big opportunity for many of the Marlies younger players as Kristian Pospisil, Erik Bradford, Jeff King and Joshua Winquist all made their debuts with the Marlies season while Derian Plouffe, Brady Ferguson, Scott Pooley and Jesper Lindgren slotted into the lineup. Laval opened the scoring early on a Jeremy Gregoire breakaway less than a minute and a half into the game but the Marlies were prepared to answer back. 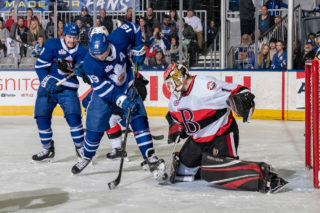 Pospisil scored his first career American Hockey League goal in his Marlies debut, corralling a loose puck and guiding it home on the backhand to tie the game. Just past the midway point of the first, Anthony Beauregard put Laval back in front and the 2-1 lead held at the intermission. The Marlies had another quick response to start the second, as Miro Aaltonen scored a one-timer after a great pass out of the corner by Carl Grundstrom just 25 seconds into the middle frame. A late goal by Jordan Boucher put Laval in front yet again at the second intermission, but the Marlies charged back in the third, scoring four straight and not looking back. Dmytro Timashov put a backhand shot through a small sliver of daylight less than a minute and a half into the final frame to tie things up once again. Derian Plouffe and Andrew Nielsen earned the asissts. Erik Bradford, who signed a PTO with the Marlies yesterday, created some space in the slot and showed patience after a great pass from Pospisil less than a minute later to help Toronto claim their first lead of the night. Less than five minutes later, Aaltonen scored his second of the game, sneaking to the back door and redirecting a hard pass from Trevor Moore to extend the lead to two. Moore would add an empty net goal in the final minutes before the Rocket added one more on the power play courtesy of Adam Cracknell, resulting in a 6-4 final. With the win, the Marlies close out the season series against Laval with an 11-1-0-0 record, not losing to the Rocket since October 28. They also improve to 53-18-2-2 on the season and are now 38-12-2-1 against North Division teams. Saturday’s game was the last of the regular season for Laval and the Rocket will finish with a 24-42-7-3 record. The Marlies will have one more test before the playoffs begin as they host Belleville tomorrow for our annual Fan Appreciation Game. Kristian Pospisil scored his first American Hockey League-career goal at 7:25 of the first period and later added the primary assist on Bradford’s third period goal in his first game with the Marlies. Miro Aaltonen scored his first goal of the game 25 seconds into the second period and added his 20th of the season at 7:04 of the third period. His second goal of the game was his seventh game-winning goal of the season. Dmytro Timashov scored at 1:55 of the third period. Timashov has six points (2 goals, 4 assists) in his last six games. Trevor Moore scored the empty net goal unassisted at 17:34 of the third period and earlier added the primary assist on Aaltonen’s second goal. Moore has recorded a point (2 goals, 5 assists) in his last five games. Erik Bradford scored his first American Hockey League goal this season at 2:44 of the third period. Brady Ferguson recorded the primary assist on Pospisil’s first period goal and the secondary assist on Bradford’s second period goal. Ferguson has three assists in his last four games played with the Marlies this season. Andrew Nielsen registered the secondary assists on Pospisil’s first period goal and third period goal. Nielsen has six assists in his last five games. Carl Grundström had the lone assist on Aaltonen’s second period goal and the secondary assist on Aaltonen’s third period goal. Grundström has three points (1 goal, 2 assists) in his first two games with the Marlies this season. Derian Plouffe recorded the primary assist on Timashov’s third period goal. Plouffe has three assists in nine games with the Marlies. Calvin Pickard stopped 26 of 30 shots. Sparks is now 21-9-1-1 on the season with a .918 Save Percentage and a 2.31 Goals Against Average. Toronto went 4-for-5 on the penalty kill and 0-for-2 on the power play. Toronto had a 37-30 edge in shots in all situations. 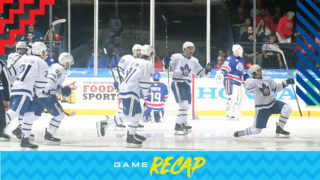 Miro Aaltonen and Carl Grundström led the Marlies with five shots on goal. The Marlies are 38-12-2-1 against North Division opponents this season and 11-1-0-0 against the Laval Rocket. 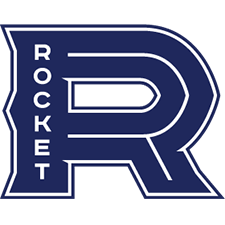 The Marlies outscored the Rocket 52-18 in the series. Pickard has been outstanding for us just in his play and as a teammate and what he has brought to our game. This is not an easy game for him to come in here and play today. We didn’t decide to play in the first period and they were all over the net and coming hard at him but he battled really hard. Well I thought today they were outstanding in the second and third period. The first period wasn’t very good for anyone including that line (Moore-Aaltonen-Grundström). In the second and third period, I thought that line was dominant. They just took over the hockey game, so that was really good to see. I thought the play of Grundström and Moore really brought (Aaltonen) to life today. Frankly, I think that is a Miro we haven’t seen since Johnsson left here. So, getting that little piece of chemistry was helpful and we did want it to come out of this weekend, that’s why we left that line in tact today. So, I was really happy to see that happen. 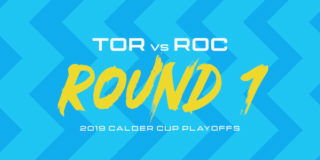 The Toronto Marlies and Laval Rocket will meet for a second straight time on Saturday afternoon, in the final matchup of a long twelve-game regular season series between the two rivals. The Marlies are hoping to continue building off last night’s 4-1 win in Laval, their tenth straight victory over the Rocket. Toronto has outscored Laval 46-14 in the series so far this year. 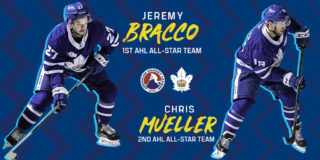 Chris Mueller had two goals and an assist in that game, and continues to lead the Marlies with 13 points (5G, 8A) in the season series versus Laval. 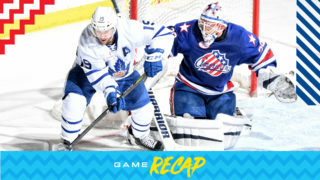 It’s another tune-up game before the playoffs for the Marlies (52-18-2-2-), who secured the league’s top spot last week. Laval (24-41-7-3) is hoping to snap an 11-game losing streak and finish their campaign on a positive note in the final game of their regular season. Trevor Moore is riding a hot streak of late, earning at least a point in four consecutive games entering Saturday. Puck drop for today’s game is scheduled for 4:00 and limited tickets are still available. Coming to the game? Enter our Insider Seat Upgrade contest for the chance to be moved up to platinum seats. Fans can also catch the action on Leafs Nation Network or AHL Live. Follow us on Twitter for pre- and post-game coverage, as well as live updates from Ricoh Coliseum.